Weathering your trains and structures is an important aspect of enhancing the realism of your model railroad. 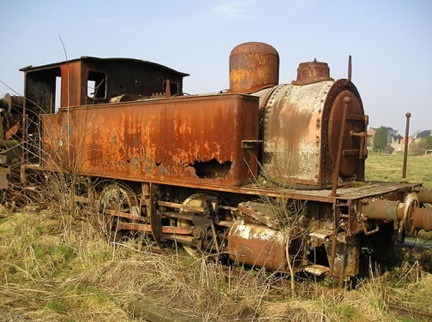 I’ve always been a little nervous about taking an expensive locomotive right out of the box and messing it up to make it look old. Truly, I usually don’t have the heart to do this right away and I will usually keep it for a while and “break it in” on my layout before I change anything. 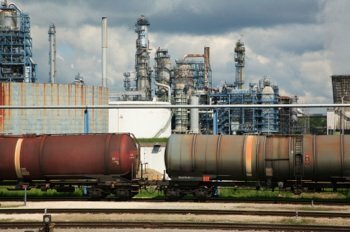 It’s easier to weather railroad cars that usually don’t cost as much. Nevertheless, you won’t get the look of realism on your layout till you start weathering your equipment. After all, when was the last time you actually saw a brand spanking newly painted loco coming down the tracks in real life. However, I think you can get away with making somewhat subtle changes to the factory finish in order to create big effects in realism. •	For rust, use Polly Scale Rust, Roof brown, Railroad Tie Brown. Use an old stiff-bristled brush – one that’s been used and cleaned over and over again- or buy an inexpensive hog-bristle brush at a craft store. Dip it in the paint, then brush off most of the paint on a paper towel. Now you’re ready to apply it to the model using a vertical downward motion so that it gives a streaked appearance. This can be very subtle if you make sure not to use too much paint on the brush. Practice on piece of cardboard or old scrap piece of plastic first. This can be used to create streaks of rust, oil loads that have spilled, or black/gray exhaust stains using the appropriate color for the effect you’re trying to achieve. Washes are a great easy way of creating a dirty looking railcar. First, make a wash by mixing 1 part of Polly Scale paint to 10 parts of Airbrush Thinner. Use a wide brush to apply the thinned mixture to the model. Brush in the direction of the wood siding or door rails. It’s best to use this method if the model has an irregular or textured surface. If the surface is too smooth, you may not like the effect as much. Sometimes the brush strokes will show on smooth surfaces, for example. As usual with model railroad painting applications, it’s always best to apply very thin coats 2 or 3 times than try to do it all with one coat. That way, you have much more control over the result. You may find that a very thin washing with one coat is all you need to create a subtle but realistic effect that you will be happy with. By the way, don’t mix a big batch of wash with the idea of storing it and using it for a year. The wash is usually only good for a few days. 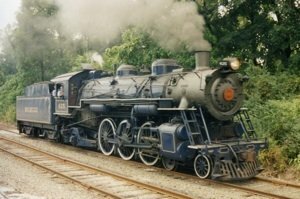 This is a great way to add stains to simulate exhaust, dirt and dust for the bottoms of railcars and overall grunge for both engines and cars. Use a wash thinned the same way as mentioned above. Experiment with your airbrush on a piece of cardboard first to get the right effect that you want, then apply a light spray on the model - mostly to the areas where you would expect most of the dirt or exhaust to be. Use black for the exhaust stains, earth colors for dust and dirt along the bottoms and rust for trucks and couplers, etc. To get a faded lettering appearance, use a wash of the same color as your freight car and do a light spray over the lettering. Add a touch of white or gray to the wash to make the paint of the car look faded overall. You can even use a combination of effects on your models. For example, you could put on some dry brushing here and there, brush on some wash, use chalk dust and then use an overspray with an airbrush – all depending on the kind of result you’re looking for. Allow for drying in between each step. If you use an airbrush a lot, make sure you use a facemask for safety, especially for solvent-based paints. It’s also important to consider a spray booth, either purchased or homemade to ventilate the spray to the outside. This helps keep the paint from getting into your lungs, all over your layout, backdrop, carpet, and other models. These are good for applying patches or streaks of rust to freight cars. Mostly, you would use burnt sienna or burnt umber for dark rust spots and raw umber for larger streaked areas. Once you’ve applied the full-strength colors where you want them, you can take a brush with mineral spirits to streak the rust color down the side of the car. Again, you can either be very subtle with this effect or as strong as you wish. Remember that it will take about 2 days for this to dry before you can do anything else with the model. Before you can use chalk on a new glossy plastic model, you have to spray it with a clear flat finish either using an airbrush containing Polly Scale, or a Model Master Clear Flat spray can. Create a powder from your artist’s pastel chalk stick by scraping it with a knife onto a piece of paper. Use a hog-bristle brush to apply the chalk to the model using quick short brush strokes. Start light and add more if you wish.Artist’s pastel chalks are probably the easiest to work with, but you can use oil pastel chalks if you like for a more prominent or darker effect. You have to use sandpaper to create the powder with oil pastels. After you have applied the chalk powder, you have to seal the dust onto the model. Otherwise they may disappear, or become smeared, to create an effect that you didn’t want. Apply a thin spray of Model Master clear semi-gloss lacquer using a spray can. Don’t get the can too close to the model while spraying or you may blow away all the chalk. When that dries, apply a second coat. You can also use artist’s crayons for streaking effects, but they are especially useful for highlighting ridges, rivets, door handles and other details that are raised or textured. Solid-bearing trucks on older freight cars tend to build up grease and oil on the wheels and rust on the sideframes, so you’ll want to paint the wheels an oily black color, and apply a rust color to highlight the sideframes. Roller-bearing trucks on newer equipment develop more rust on the wheels themselves. You may therefore want to paint the outside hubs of these wheels a rust color. Also, to show the effect of sun damage, paint loss, and wear and tear to the galvanized roofs of boxcars, you can apply a light coat of Polly Scale Flat Aluminum to the middle length of the top of the boxcar, and then apply a thin coat of grimy black to dull the silver effect. Dry brushing or airbrushing could be used to do this. Tank cars often have streaks of load spills on the sides coming down from the hatches. You can use dry brushing to create these streaking effects either lightly or strongly as you wish. The lettering on freight cars sometimes runs onto the paint below with aging. You can simulate this using an artist’s crayon of the same or similar color as the lettering and applying a light streak effect below each of the letters. 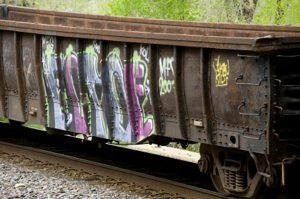 Graffiti is a common sight on the sides of freight cars.. You can simulate this either by purchasing graffiti decals or by painting these on yourself using gel pens. Just make sure one color is dry before you add another color. A black wash should be applied with a brush to all the grills and louvers. Add grimy black to the exhaust stacks. Use a dry brush to apply steaks to the cab roof. Add rust streaks to the outsides of the exhaust stacks. Brush paint the tanks on the bottom of the loco grimy black or flat black. Use an airbrush with a thinned grimy black and/or brown wash to weather the trucks. Dry brush or airbrush a faint coat of earth color to simulate dust and dirt along the bottom of the sides. On black diesels, add a little silver highlighting to the fan blades. Use white chalk to make the roof a shade lighter. Apply a grimy black stain around the exhaust stacks. Then overspray the whole shell with a faint wash of gray to make the black not quite so black. Use the same techniques for steam locos, applying a faint flat gray overspray to lighten up and flatten the original black. This will also help show off details of the engine that were difficult to see when it was too black. Use chalks, crayons or dry brushing to add flat or grimy black to exhaust stacks and to faintly streak the cab roof. Use a faint spray of brown wash to simulate dust or dirt on the bottom of the front and sides. Add a little rust to the couplers. Use the same techniques mentioned above to make the wood siding on buildings look streaked and worn. Apply streaks to the roofs, especially coming down from chimneys and vents. Make "cracks" in mortar lines of large buildings. Apply flat dark washes to factory buildings. Make subtle streaks come down from cornices or eaves or under windows. If your glazed windows have become flat by the flat finish that you’ve sprayed on the structure, restore them with clear gloss. Use washes of paint to make mortar joints a different color than the bricks or stones on the walls. Or use faint washes of India Ink to make details and textures in your walls or roof stand out. In all of your weathering efforts, it is frequently helpful to look at photos of the prototypes to see where the weathering has occurred and in what colors. Always start lightly at first then add more, if you wish. Try to simulate real life with the methods described above, but don’t be restricted by these methods. As always, it’s good to use your imagination and create new techniques for doing things. That’s part of what keeps it interesting and keeps us all growing.